My grandfather passed away peacefully on Friday. It was unexpected and happened very fast. He was a strong 92 year old, and I somehow expected him to live to be 104. I am glad that he was able to enjoy these quilts for a little while. Among many other memories, I will remember the nice things he said about my quilts, and how he was afraid someone would steal them. It will always put a smile on my face. I am happy that he is reunited with my grandma, who never had a chance to meet her great-grandchildren. I know that he will tell her all about them. Love you, Pampa. We'll miss you. My challenge this week, was a challenge in more ways than one. On Wednesday, we returned from a week-long family vacation in the Outer Banks of North Carolina. We like to think of it as our home away from home. My mom and grandpa picked us up from the airport. I am glad we had one last time to see him. Thursday, I was still in vacation mode and unmotivated to do anything, although I did finish a quilt back. I have so much to do and I am beginning to feel very overwhelmed. Friday just made my motivation even worse. But, on Sunday I decided, I better just get back to work and maybe stop thinking so much about "life". With Amy's gentle push, I challenged myself to finish a quilt back and possibly baste a quilt, and I did. Yay. My "Music Man" quilt is finally basted and ready for quilting. I originally had something else in mind for the back, but when I finished it, I was very unhappy with it. 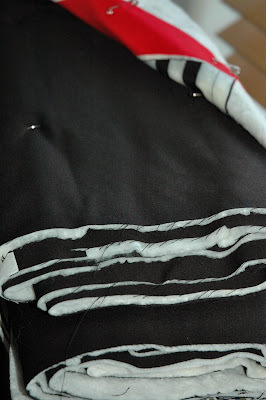 So, instead of getting overly frustrated with the entire quilt, I decided to start over on the back. I'm glad I did. I'm much happier with it now. I need to finish this quilt no later than the 29th, so I feel like I'm cutting it kinda close. But, I think I can do it. I am hoping to try something different with the quilting on this one, so stay tuned for more pics. Ah ça--I read the first part of your post and didn't know what to say. I'm sure the sudden loss your grandfather is a great blow, the more so for being unexpected. I hope your memories of him bring you consolation. 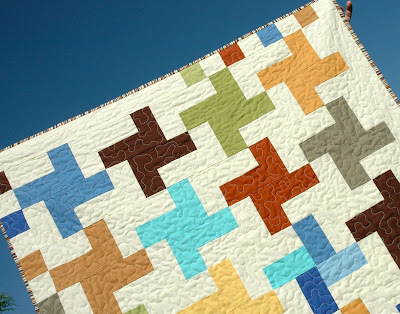 I'm intrigued to see your music man quilt, and well done for making a new backing and moving your project forward. Sorry to hear about the loss of your grandfather. 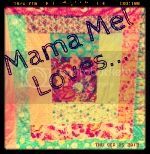 Looing forward to seeing more pics of your quilt. I popped to your blog from Amy's. I'm so sorry for the loss of your grandpa. My grandpa is close to the same age and while he's always been strong as an ox, his age has caught up to him in the last few weeks. Your post reminds me how important it is to make a phone call today to say hello. Have a gentle day. Sorry for your loss. I bet your grandfather would be glad that you continued to work on the quilts he loved to see. Thank you for sharing this with us. Your Grandpa would be proud of you. Looking forward to seeing more pics of your Music Man Quilt. Hugs to you!! Sorry to hear of your loss, Congrats though on completing your challenge! 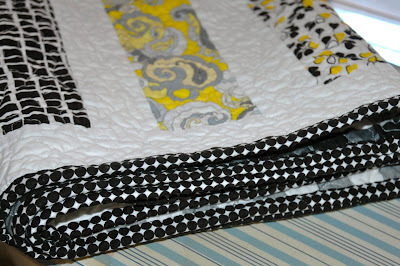 doesnt it feel nice to be one step closer to being finished your quilt!! So sorry for your loss! And you still got yor challenge done - you can make it till the 29th! I'm sorry about your grandpa, but it's good that you got to see him one last time. And after seeing those quilts, I understand why one might worry they get stolen - they're goergous. And congrats on finishing your challenge. Amy is so great for giving us this kick in the behind each month! So sorry to hear about your loss. It is always hard to loose somebody no matter how old they are. It was good for you to focus on something that you love doing right now even it frustrated you a bit. It would have made your grandfather proud I am sure. I'm so sorry for your loss. And I'm so impressed with your ability to take time to work on something you love to do. Good for you!